The search is over! I have finally found a great deal on a tomahawk made by Cold Steel. It's called a Norse Hawk! Capturing the Viking spirit, the Norse Hawk’s 4" blade features a highly curved cutting edge and terminates in two sharp points. These points increase the chance of a stick when the Norse Hawk is thrown. The head of the Norse Hawk is drop forged out of 5150 steel and coated black. The cutting edge is differentially heat treated, and its blade is 4 inches wide, and sharp, for excellent scoring and penetration. - 6 ounces and it throws beautifully! The handle is so smooth the hawk just glides right out of your hand! For a limited time the Norse Hawk will sell for only $30.95 + Shipping. "I will attest to the virtues of this Hawk. 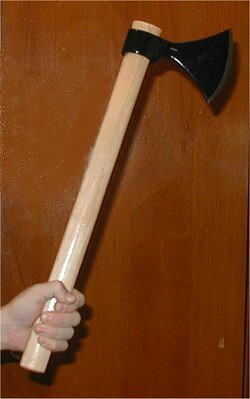 After doing online research and finding an article on what to look for in a throwing axe, I finally found the Norse Hawk. It fit the requirements for a good throwing axe and also met the requirements for a SCA (Society of Creative Anachronism) throwing axe. At our last meeting a whole bunch of people borrowed my Hawk and did well with it. IT became the favorite one for everyone to borrow!"